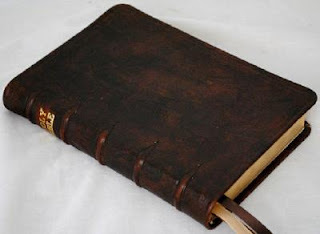 If you have a favorite Bible that needs to be re-bound, Bible Design and Binding commends an interesting and attractive, albeit rather expensive, option: Leonard’s Book Restoration and particularly "Leonard’s Historical Bible Series." I don't have a particular Bible that would benefit from this kind of treatment, but if I did "The 17th Century Country Parson Style," described as "a tribute to the hardworking country parsons and village preachers, then and now," would be my choice. You send them the Bible you want re-bound and they return it with your choice of one of these bindings. Mark Bertrand provides a lot of descriptive information, and many pictures, of the "Country Parson Style" in both the soft bound and hard cover versions.